By the late Middle Ages, the Italian peninsula had become an ever-changing patchwork of petty kingdoms and free cities. There was no slow rebirth of town culture in northern Italy, because it had never truly perished. Instead the towns slowly re-established their dominance over the countryside and the urban nobility gained preeminence over their rural, land-holding brethren, led by a combination of military and administrative post, the “captain of the people” was often chosen from members of the old aristocracy, wealthy merchants, or from common-born mercenary captains. At first controlled by the dominant political party, the capitani grew increasingly powerful, and quickly became despots. In many cases, they dispensed with the new title and assumed the old hereditary titles of marquis, count or duke, whether they came from old noble families or were upstarts raising themselves up as the new nobility. Their wars to gain, hold, and influence other cities put the peninsula in a state of nearly continuous, small-scale warfare. Desiring to establish their legitimacy, the despots sought to make their courts the envy of Europe. Those who embraced the new ideals of humanism became great patrons of art, science and learning. The lord acquired renown as a man of culture, learning and wealth, periodically gaining additional civil or military service from the courtier, while the courtier gained far more: stable financial support, prestige, and a chance to develop his work without having to fight against the pressure of daily life. It is a perfect summation of the late medieval Italian condition that the flourishing of ideas and artistic expression that became the Renaissance was built upon the bloody ambition of despotism. All of these changes produced a culture in which members of a wide variety of social strata not only desired or required training in arms, but also had the means to acquire it. The professional fencing master or “master-at-arms” entered to fill the gap. Originating as a battlefield art, the practitioner had to be versed in a multitude of weapons including the sword, spear, and axe, in or out of armour, on foot or horseback, and against any number of opponents. 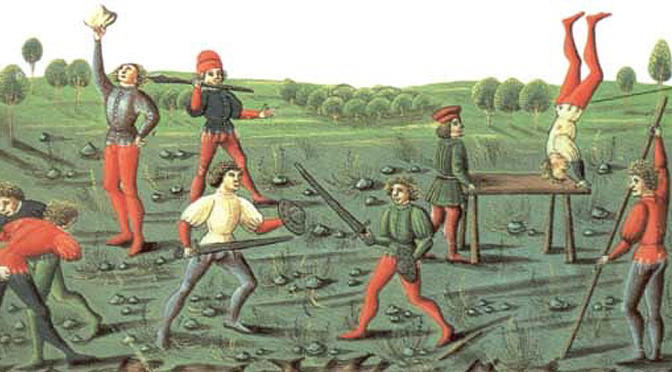 As the Renaissance brought sweeping changes to European culture, so to did the Italian fencing traditions evolve and diverge, with a new focus on civilian swordplay. Eventually, a new, uniquely Italian weapon and fencing style —that of the elegant rapier— emerged and swept across Europe, influencing most of the continent for well over a century, and laying the theory of Italian fencing for the next three centuries.